Anyone who paints with acrylics will know how fast they dry. While that's a good thing when it comes to getting artwork finished quickly, it's not so good for keeping colours mixed and ready for a few days (or even months) while you work on a project. Stay-wet palettes are available in all good art shops - at a price - and they're great for keeping paints workable for much longer. You can make a perfectly good one in a few minutes at home. You might even have all you need already to hand (and if not, it won't cost much). Because I sometimes use quite large quantites of some colours, I mix quite a bit of those colours all at once - and I always use a stay-wet palette for them. It means I can carry on using the colour for maybe a few months, whereas left out they'd last just minutes. a plastic tub with a lid that seals. For small palettes, you can use the food tubs that you get at some takeaways (they also sell them 8 or 10 in a pack at the pound shop). You can also use larger plastic tubs if you want a lot of colours on one palette. 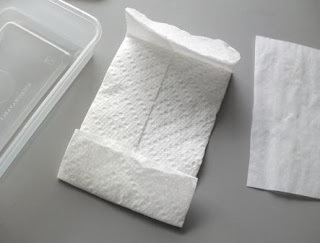 absorbent paper - I found the best is the kitchen towel called Plenty (other kitchen towels leave paper bits in your paint but Plenty doesn't, and no I'm not being paid by them!). If you don't have Plenty in your country, do you have a kitchen towel which claims to be stong and hold together longer than others? 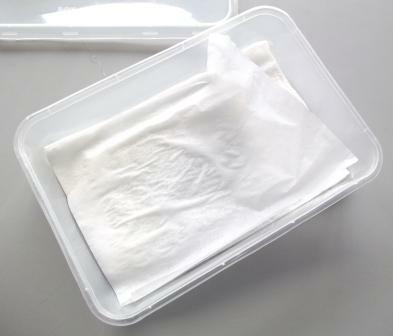 You could also use a non-woven cloth - anything which won't shed fibres. Cut a sheet of greasproof paper to fit in top of the kitchen paper and place it on. That's it - it's really that simple! 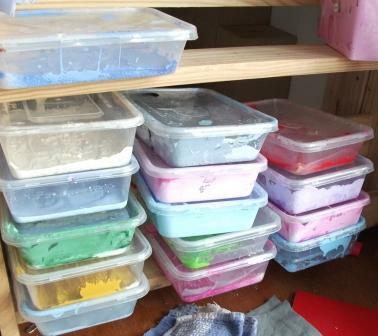 You can mix your paints in there and keep them for weeks or maybe even months. If you find they are a little thin or watery, you've probably added too much water to the paper towel. 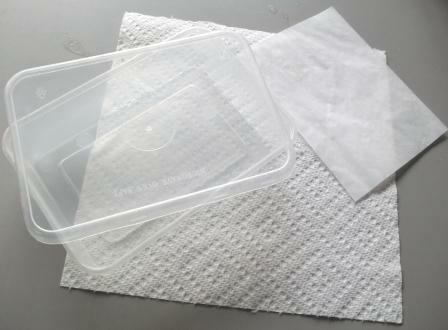 If you find they dry up quickly, you may not have added enough water (or you left your lid off!). You might find you end up mixing all your colours this way - I do! It certainly saves a lot of waste. I had no idea they would keep for so long - it's such a pain trying to remix the same shade exactly! Anything to make life easier. Yes, it definitely makes life easier! They're more likely to last longer if mixed in larger quantities, but it extends their life considerably, even in very small quantities. This is a great tutorial and so well timed! I got on the computer this am with the intention of finding some books about painting and paint, since I know almost nothing about them! Thanks for a very handy piece of advice, I look forward to more in the future! What a brilliant idea. Will definitely be using this! Fabulous!!! I will love not having to mix and remix every time! Don't you have to put in something to stop mold ? I can imagine many uses for this (enamels, clay etc.). Thanks for sharing!!! You might see mould occasionally on the paper, but if the tub's spotless to start with, it's unlikely - I've not had much of a problem with it, and never in the actual paint (which probably already has a mould inhibitor). Brilliant. 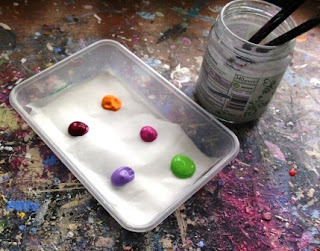 I never knew such a thing existed and it is just what I need, am doing a long term painting project at the moment and I have been using jam jars and empty cream cheese contains as palettes. Brilliant idea, thanks for sharing. What a great idea. 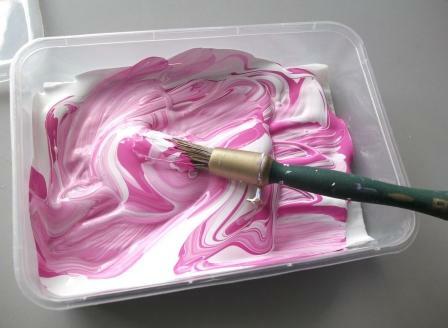 I work with the elderly and we paint occasionally and I have such a lot of wastage as I have to mix the colours for them and them wash the pallettes to put them away. I will definitely use this system. Thankyou. Oops. Forgot to ask... Why does it matter what quality of kitchen roll you use? surely the grease-proof paper will prevent any bits of kitchen roll from getting into the paint. Martin, I tried it with cheaper kitchen paper, and the wetness causes it to shred and it does end up in the paint. Might not be too bad if you only have small blobs of paint. Oh, thank you for posting this. Love this idea! Wow thank you for that! I am so doing this,. I just need to buy those tubs so that I can have a place to put my colors! I also love your blog! So nice to discover it! If it will be a while before I get back to painting, I put my stay wet palette in the freezer and defrost a day before using it again. No mold, and paints can last indefinitely. Brilliant! I’m making it up right now!! !